Green Party presidential candidate, Dr. Jill Stein seems determined to do her best to make it impossible for me to vote for her in the upcoming election. While she still has an edge over Hillary Clinton with regard to the likelihood of receiving my vote, that isn't saying much. And when what you see below recently appeared on her Facebook page, my tentative plan to support her is going to require some additional thought. Clearly, we have come a long way as a society if we are now to the point where a presidential candidate can go out of her way to alienate half of the electorate by resorting to blatant sexism (i.e., "mansplaining"). Right. Because I'm 100% sure that no woman has ever criticized Dr. Stein or attempted to explain something to her for any reason. 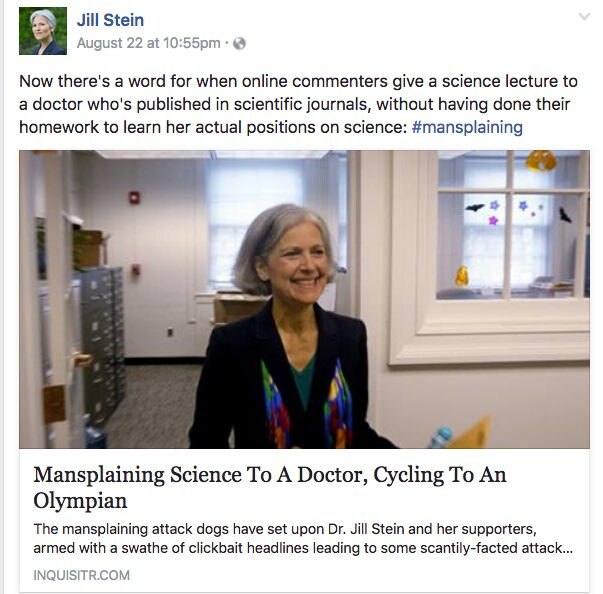 And yes, for those who will disagree that "mansplaining" (or my personal favorite, "manspreading") are inherently sexist, there's the far more important issue of whether Stein's decision to deflect criticism and attack her male critics in this manner is a better option than directly and unambiguously clarifying some of her statements regarding vaccines, wi-fi signals, alternative medicine, and the like. My guess is that it is probably not going to help her in the polls. What Dr. Stein seems unable or unwilling to recognize is that lots of people have concerns about her positions on some of these issues, concerns which they have invited her to address repeatedly. Many of those who have these concerns, including me, are people who desperately want to be able to support her. We're not trying to tear her apart; we're doing our homework to make sure that she's the candidate for us. And sadly, many of her attempts to address these concerns have not helped. Some have even made things worse for her. This is a problem she needs to solve if she is going to be a viable candidate. It is not about "mansplaining;" it is about seeking clarity on her positions.